Democrats on Capitol Hill Tuesday added several more gun control bills to the hopper for the 116th Congress to include regulating downloadable gun files as well as many popular firearm magazines. Some 29 Senate Dems lead by Sen. Bob Menendez of New Jersey, allied with House Democrats spearheaded by Florida Congressman Ted Deutch, announced their “Keep Americans Safe Act,” which would ban the import, sale, manufacture, transfer, or possession of firearm magazines capable of holding more than 10 rounds of ammunition. Those prosecuted under the bill could see as much as five years in prison. “The Keep Americans Safe Act would finally limit the sale of large capacity magazines that are not designed for hunting or self-defense but instead for killing as many people as possible without having to stop and reload,” said Menendez in a press conference attended by numerous allied gun control groups. The bill, which has been introduced as S.447 in the Senate, would grandfather such magazines already in circulation and make future exceptions for those used by the military or police as well as for .22-caliber tubular magazines. There would be a “buyback” program established to use public funds for the purchase of unwanted legacy magazines. New magazines made after the ban would have to be serialized and marked with their date of production. The measure has been referred to the Senate Committee on the Judiciary and has drawn applause from gun control groups. 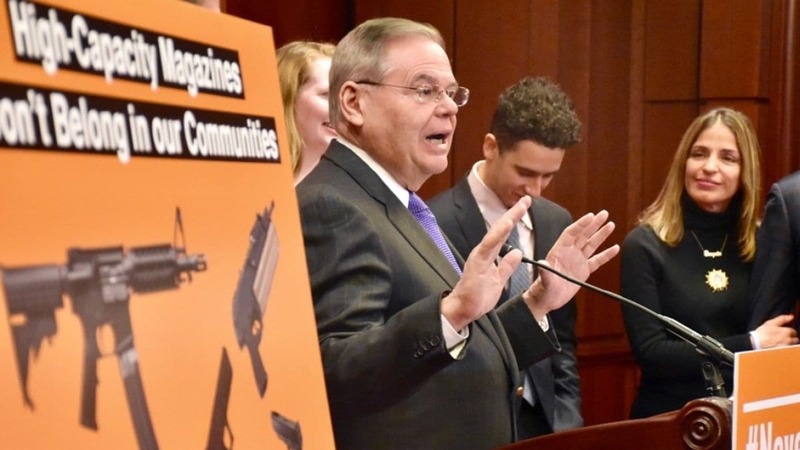 Besides the move to prohibit many common standard magazines, Menendez this week also kicked off a drive to bar the unregulated distribution of plans and technical information related to the manufacture of small arms. This measure, which includes 3D printed files, restricts information under a Cold War-era international arms control apparatus managed by the U.S. State Department. Dubbed, “The Stopping the Traffic in Overseas Proliferation of Ghost Guns Act,” the proposal would require potential transfers and publication of such data be conducted only after notifying Congress beforehand. During the entirety of the federal government’s multiyear legal battle to prevent the online posting of 3D gun files by Texas-based Defense Distributed, both the State Department and the Department of Justice said Washington can do little to prevent the spread of the files domestically and instead based their case on controlling distribution overseas. A federal judge said last year the 1970s-era Arms Export Control Act that the government used to halt the distribution of DefDist’s mostly plastic Liberator pistol keeps the files from being uploaded to the internet, but they can be emailed, mailed, securely transmitted, or otherwise published inside the country. The legislation has been introduced as H.R. 1134 in the House and S.459 in the Senate. All told, Democrats have introduced nearly 20 anti-gun bills in Congress in the past five weeks, ranging from forbidding the online sale of ammunition to repealing legal protections for the gun industry from frivolous lawsuits. On Wednesday, the House Judiciary Committee is expected to mark up H.R. 8, a universal background check bill, which would set it up for a floor vote. U.S. Sen. Pat Toomey, R-Pa., thinks there are 60 votes possible to support a similar move on background checks in Senate.